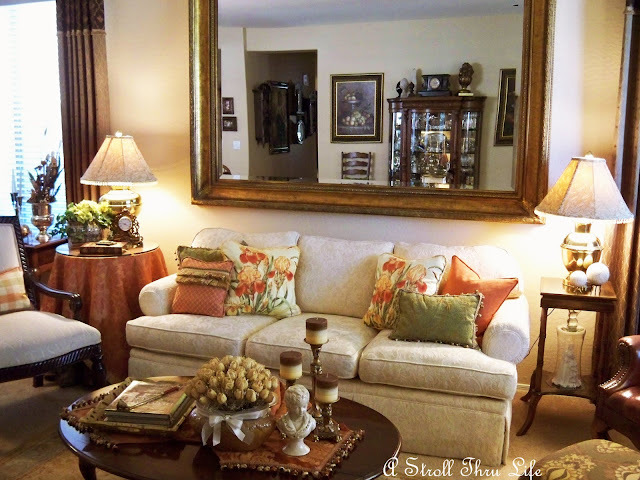 Yesterday I showed you some changes in the livingroom with different lamps. Now I want to show you with different shades. These are some lampshades that were custom made for my brass lamps and used in my last home. Kind of expensive, so of course I've kept them. When I was switching out the lamps, I suddenly got curious as to what these would look like in my home now. Two posts in one day, wow, I'm on a roll. Remember I showed you the white lamps that I am using now in the living room. Then how different everything looked with the brass ones. Now everything looks totally different again with these shades. Just amazes me. The thing I had forgotten since I havn't used these shades for a while is how pretty they look with the light off. So, not only do they have a lovely pattern when turned on, but they are beautiful during the day with the light off. The other white one on the right side of the sofa. Then with the brass one. Again, such a huge difference with this shade. Again how the room looks with the white lamps and shades. 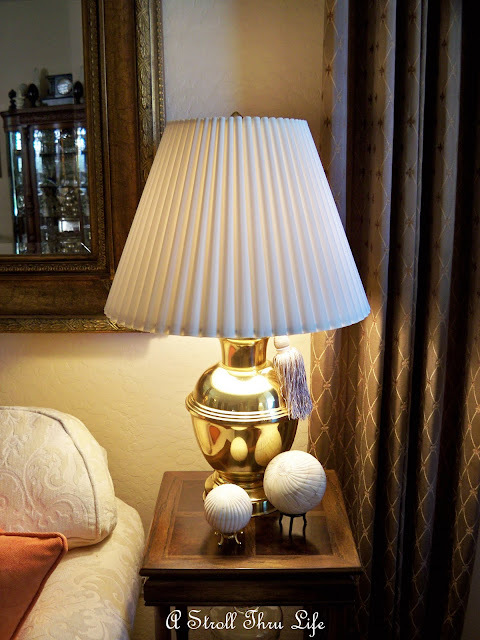 Brass lamps with the white shades. 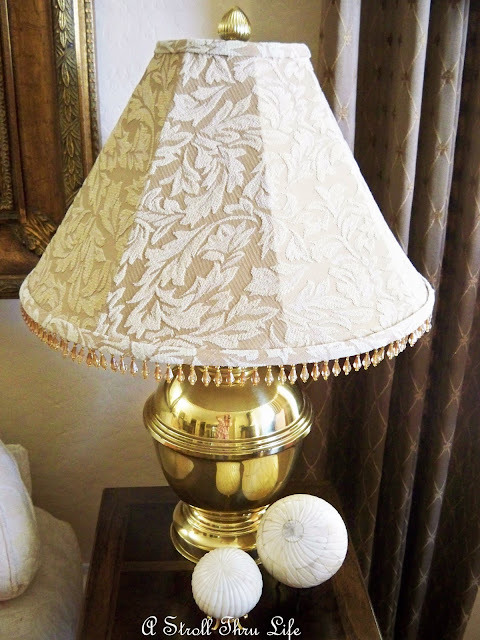 Brass lamps with the patterned shades. With the lights off in the entire room. Everything totally changes again with the patterned shade. Amazing. Switch a few things out in your home and I am sure you will be amazed at the changes. So, what do you think? Let me know. Nice brass lamps and I do prefer these shades. I always switch mine around. Easy change. The lamps are gorgeous with the new shades! Great shades, Marty! They look like they work well in this room, too. I don't blame you for holding onto them. Shades can get expensive when they have fabric on them. I'll bet these would look good on the white lamps, too! Love the last change the best. 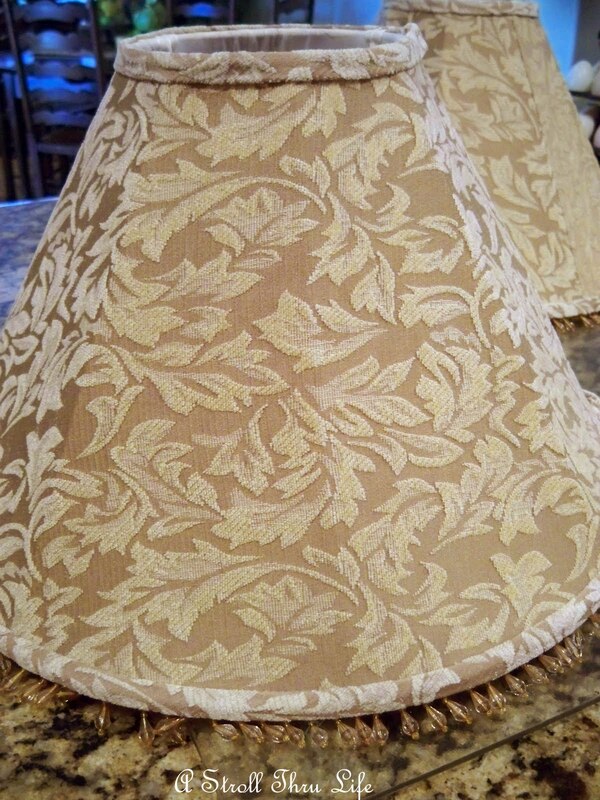 Gorgeous lampshades with the copper base. And, beautiful, as well, with the lights off. Those patterned shades look the best! I found your blog through Char's and I am so happy I did! 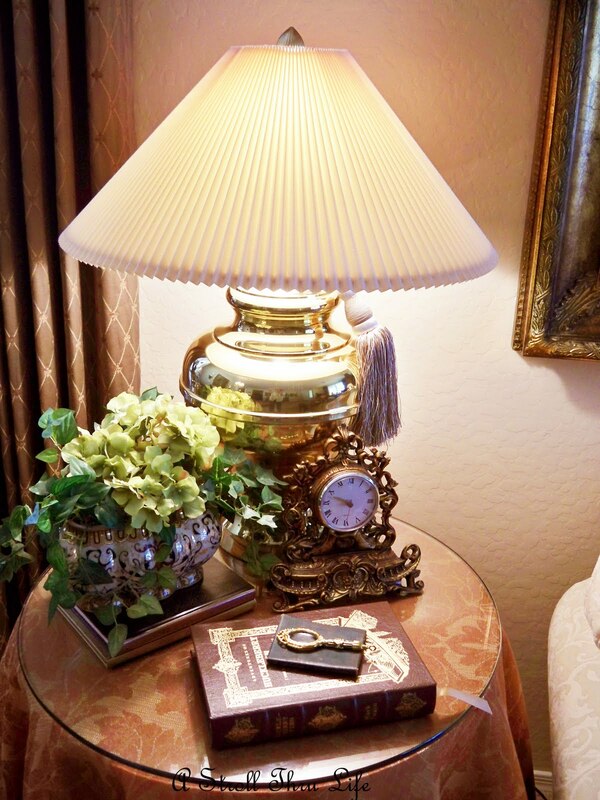 I love how you experimented with the different lamps and shades....It doesn't take a lot to give a room a whole new perspective...I love the brass lamp with the patterned shade. Gorgeous! Everything you do looks gorgeous! Those shades are so beautiful I think they were worth every penny! Glad you are getting to use them again. Aren't you happy when you actually do keep something and find that special place for it later!? 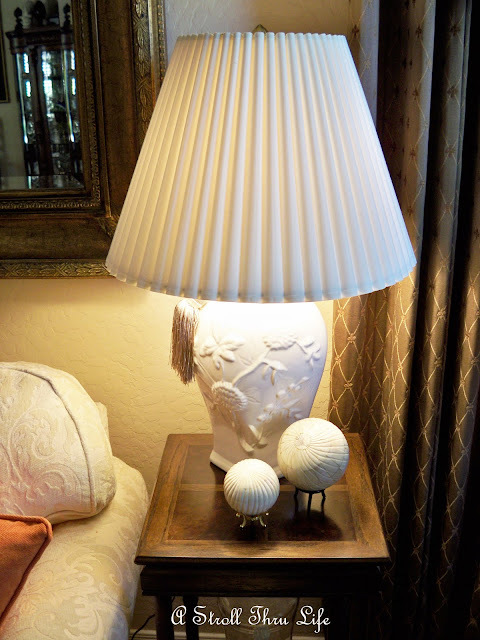 The patterned shades look wonderful on the lamps. 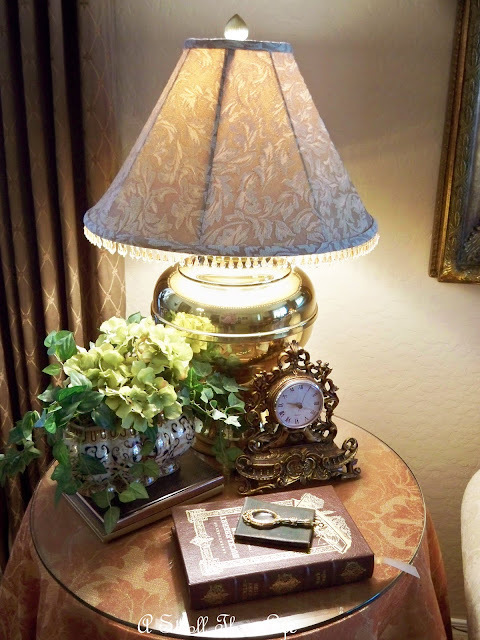 That was the perfect shade for that gorgeous lamp. Love it! Love those beaded shades, Marty! It is amazing how little changes can make a huge impact in a room...never ceases to amaze me! Beautiful beaded shades! Nice change. I love it all,but my favorites are definitely the patterned beaded shades! Beautiful! Hi Marty!! I like the pattern on the shade. Have a GREAT weekend. Marty, I love the patterned shades the best but think maybe you should keep them and use them in the winter.The white looks a little more summery to me. 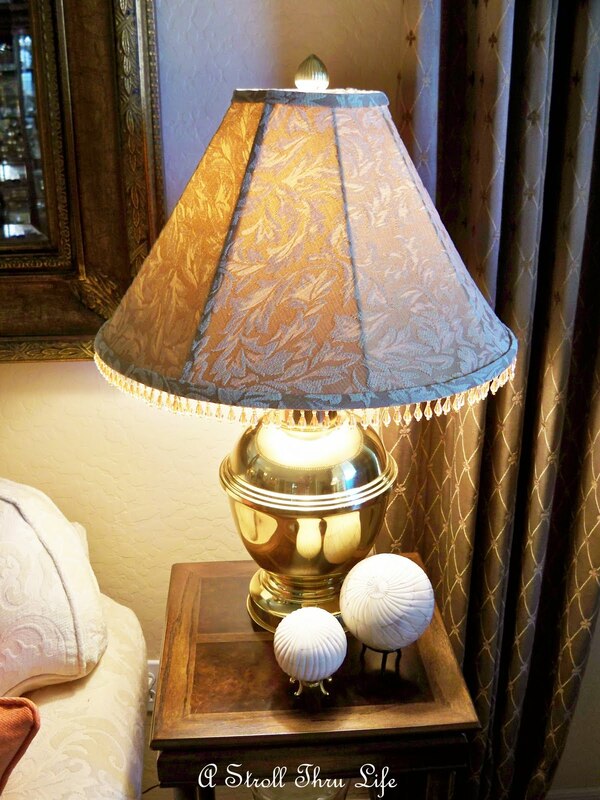 Once again, I am loving the brass lamps but those custom shades are to die for in my book! 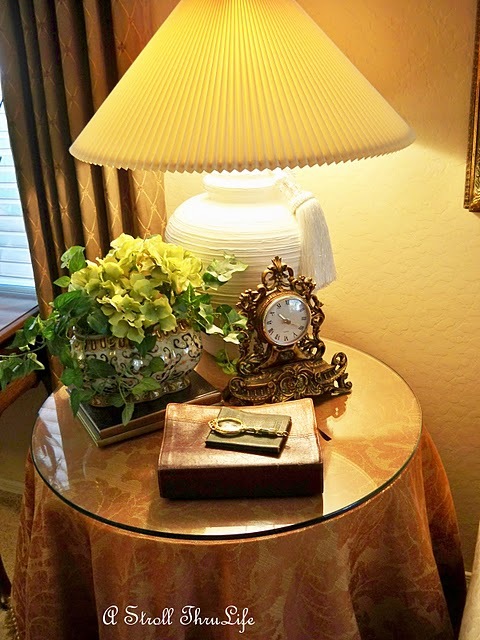 I Love how the room looks with the brass lamps and the "fancy' shades! LOL! I really like these patterned shades. they just really look beautiful with the brass lamps. Softens the glare of the light through the shades too! Nice change. I like the brass lamps and the designer shade! The brass lamps with the patterned shades look just wonderful! 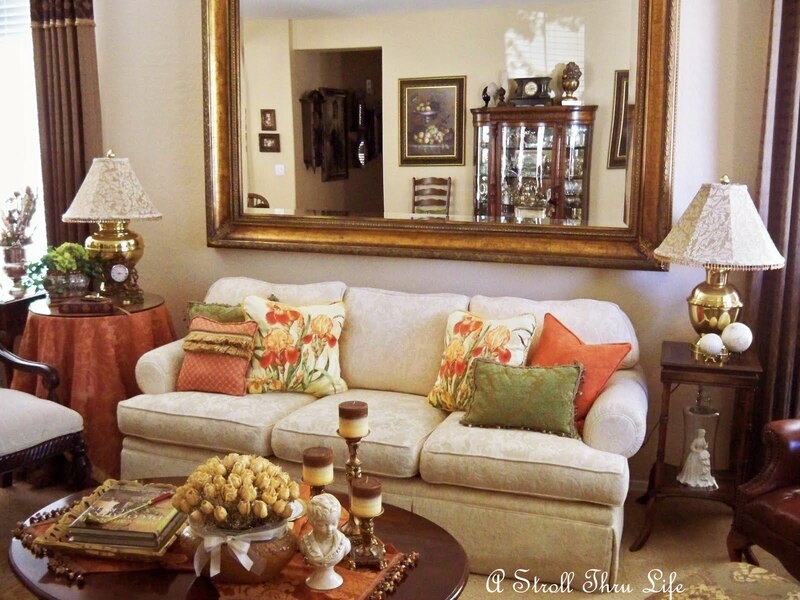 Love how it all goes together in your full room picture! Very pretty fabric Marty. I love it! The new shades look better with your drapery and sofa fabrics. Nice change. Ohh, ohh, did you try the patterned shades on the white bases? I think the white bases would pick up the white/light color in the shades and be beautiful. Hi lovely lady. I love the Shades with the patterned just Beautiful Marty. I hope you have a nice weekend. 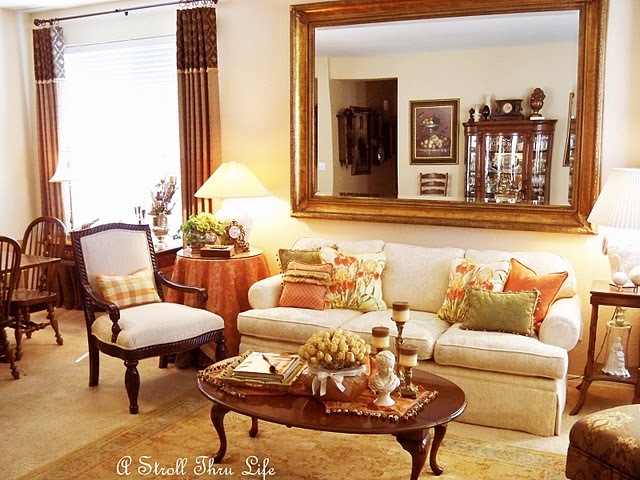 I love those chunky brass lamps and Im lovin the pillows on the sofa! I'm liking the patterened shades. They add another layer of texture! 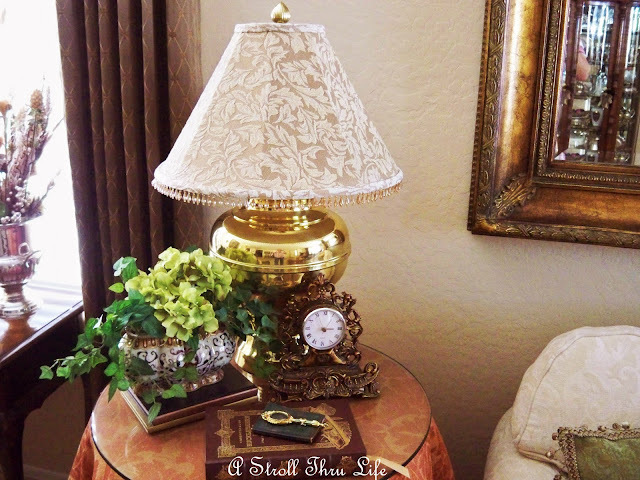 Wow, who knew that the brocade pattern could make a brass lamp look so new and great? I love them. Oh yes, definetly the patterned shades-they look so expensive! Oh, and no, sorry, can't help with the fb like thing from your newest post. The patterned lampshades with the brass lamps is my choice. Although all of the choices work. I really like your white sofa. I have two white sofas that are starting to show some age. 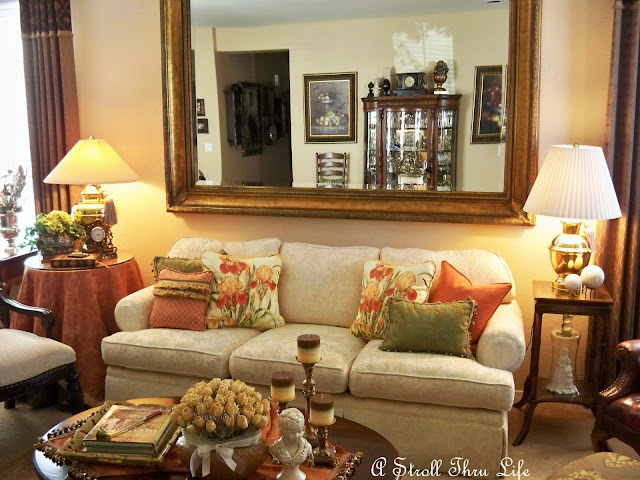 I have been having trouble finding two white sofas with a damask texture to replace them. Do you mind sharing your source/brand name etc. of your white sofa?